The white man's Arizona Gold Rush started in the late 1880s after several chance discoveries of the precious ore. The search for gold, though, began centuries before when, according to legends of the Lost City and Lost mine, Spanish settlers operated a secret gold mine in the Santa Catalina mountains. Read about Gold in the Catalinas pre-Arizona times. "The maneuvers of a rat led N.H. Ingoldsby to the discovery of a rich gold mine In southern Arizona. He appropriately named the property the Rat Hole mine. Mr. Ingoldsby had been spending several months near Mammoth, on the San Pedro RIver, in Arizona. His purpose, says the Tombstone Prospector, was to enjoy the hunting and make a collection of the animals and minerals of the southwest. He pitched his tent in the canyon of the San Pedro in the Santa Catalina mountalns. He had no neighbors and was for a long time unable to account for the disappearance of small articles that he left lying about his camp. At last he noticed that when anything was taken something was left In Its place. This was usually a bit of stone or wood. The culprit he found to be a large rodent of the species known as the trading rat. The habits of the animal made an Interesting study for Mr. Ingoldsby, and he often lay awake at night to watch for his visitor. In a 1901 article in the Arizona Republican, titled "Canada del Oro, A Rich Mining District in the Catalina Mountains." Gold-in-quartz was made popular as jewelry in the 1890s when Tiffany & Co. gemologist George F. Kunz wrote about it in his book "Gems and Precious Stones of North America" (Dover Books, 1892). Miners would usually grind up the stone to extract the gold, but gemologists created jewelry, watches and trinkets made of quartz in gold. "Single specimens for scarf-pins, rings, and sets of pins and earrings sell from $2 to $10 each. Exceptionally fine or curious pieces bring higher prices. It is within a few years that gold quartz has been utilized to any great extent in jewelry. At first the designs were usually simple and the mountings modest, but the demand has created a supply of elaborate designs, and at present the quartz is used in every conceivable form of jewelry, and in articles of personal adornment and decoration of almost unlimited variety, such as canes, paper-weights, writing-cases, perfume- bottles, fan-sticks, bracelets, watch-chains, and lace-pins, the lat- ter in such designs as shovels, picks, and other mining emblems. In certain new furniture, it has been used as paneling ;	and here, as in jewelry, the effect is better brought out by added colors, such as are afforded by agate, moss agate, native silver in a matrix, smoky quartz, iron and copper pyrite, cinnabar, mala- chite, turquoise in the matrix, and other bright minerals. By slitting and piecing, as is done with malachite, an entire table- top can be made from a few pounds of gold quartz. 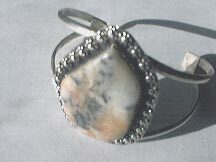 Much of the jewelry made of this material is sold to tourists from the Eastern States and elsewhere. While all of the substantial gold bearing quartz ore has been hauled away from the mountains, fortunate prospectors can still find quartz bearing gold and silver, in select areas of the mountains. Today, these stones are mined from the same locations in the Santa Catalinas and sold as Cody Stone. 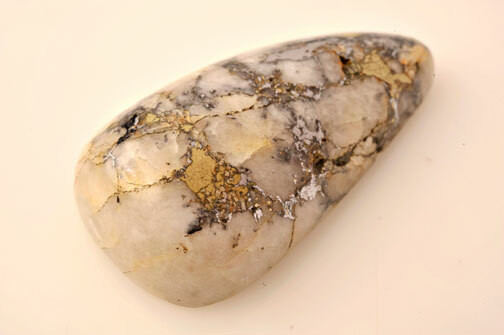 Photo: Cody Stone showing the detail of the gold in the quartz. 2. Arizona Champion, Peach Springs, Mohave, A.T. Arizona, October 2, 1886, from the Tucson Citizen. 5. "The business of being Buffalo Bill: selected letters of William F. Cody, 1879-1917" By Buffalo Bill, Sarah J. Blackstone. Page 94-96. 8. "MINERALAPPRMSALOF CORONADO NATIONAL FOREST, PART 5 Santa Catalina-Rincon Mountains Unit Cochise, Pima and Pinal Counties, Arizona" U.S. Bureau of Mines, MLA 25-94 1994, p. 19. Read more about the gold rush in Arizona, mining and Camp Bonito from The Newspaper ARCHIVE.com, the largest historical newspaper database online. Its web site contains tens of millions of newspaper pages from 1753 to the present. Every newspaper in the archive is fully searchable by keyword and date, making it easy for you to quickly explore historical content. Newspaper ARCHIVE.com is constantly adding newspaper pages - with one newspaper page added every second - that's over 80,000 images a day, or about 2.5 million pages per month! Find anything from any year back to 1759 in the World's Largest Newspaper Archive!